In arid regions of the world such as Saudi Arabia, thermal desalination technologies such as Multiple Effect Distillation (MED) are the mainstream technologies for producing desalinated water for both the residential and industrial sectors. Thermal desalination technologies are generally characterized by its high capital intensity. Fixed cost charges in MED typically account for 40-50% of the unit cost of production compared to 30% in RO . This poses a challenge in distressed thermal desalination network with an incessant water demand growth as the conventional approach of large grassroots expansion projects can lead to low capital productivity. With the emergence of new technologies such as Membrane Distillation (MD) that can integrated with existing conventional thermal desalination units to boost water recovery, the problem of water demand growth fulfillment in a desalination network extends beyond searching for the optimal capacity expansions to finding the optimal portfolio of projects in the planning horizon. The considered technologies vary in their capital intensity, modularity, and performance calling for an overarching optimization framework of the capacity-planning problem. 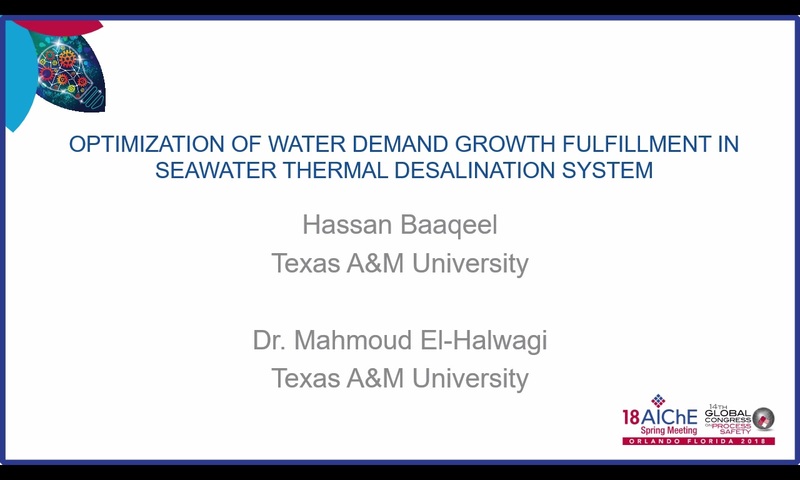 This work develops the optimization framework for the fulfillment of water demand growth in a distressed desalination network considering a set of technological alternatives which are both discrete and continuous in nature. A superstructure representation and optimization formulation are introduced to simultaneously optimize the investment portfolio in the desalination network for the minimization of the total net present value (NPV), which includes both annualized fixed and operating costs as well as salvage values, over a specified planning horizon. The framework is applied on a case study for the fulfillment of a linear water demand growth and an existing MED desalination system. The results are reported using a Pareto chart to show changes in the optimal projects portfolio with key parameters changes.